"For as Jonah was three days and three nights in the belly of the great fish, so will the Son of Man be three days and three nights in the heart of the earth" (Matthew 12:40). "In the heart of the earth" is the wickedness of man's heart, as explained in the parable of the four soils (Mark 4:15, Matt 13). Man's heart is exceedingly wicked (Jeremiah 17:9) and Jesus Christ was immersed in it from the moment He was "betrayed into the hands of men" until He rose again at the dawn of the third day. The Bible clearly says so. What would be a greater shock to His system than becoming our sins, that He could then be presented as the sacrifice in perfection, which Scriptures show is all part of the three day and three night time frame? ALL of the Scriptures add up to this. Twelve verses describe the three days and three nights and they all include the betrayal or His suffering. Below are three examples. As Scriptures indicate, Jesus became sin on the night He was betrayed, included suffering, the crucifixion, death and resurrection, totaling three days and three nights. Christ had to become sin before payment could begin or the blood would be wasted. The chastisement "was upon Him." 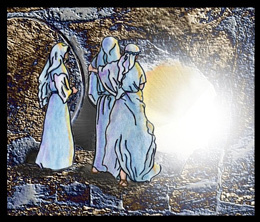 The miracle of Christ's redemption began on Thursday night when Christ became sin, the night He was betrayed, immersed in our sins and delivered unto man. THIS was the "heart of the earth" that Jesus spoke of. He never said it was the tomb, for to be separated from God as He became sin would be far more shocking to His system than mere death. Before the first drop of His precious blood, Jesus suffered far more than physical death, He became sin which separated Him from His Father, in the heart of the earth, in the belly of the whale. Beloved, do not let anyone sow seeds of doubt within you. They do not understand because they do not know the Scriptures. The Bible has always been reliable and it will always be. As man continually changes and rewrites his best guess to impress, the Bible continues as the solid anchor in truth. Man continually looks back and tries to manipulate facts to appear wise and yet fails. God looked forward, wrote it down and gets it right every time, continuing in truth today as prophesies unfold in the news. Jesus told us that we would be hated, He said that He tells us these things that we would not lose peace. So as the world rages over gay marriage, as false christs come forth and attempt to rewrite what God said, have no fear. God knows who you are and where your heart is. He will not leave or forsake you. Hang on to what you have and do your best to protect your children. Pity those who have caused your little ones to stumble, God knows who they are and has written that it would be better if they had never been born.